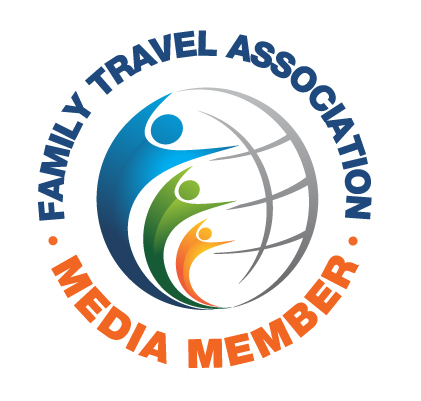 Daytona Beach has a reputation for being a spring break Mecca for college students, but the city has recently been ramping up its efforts to become known as a family-friendly destination. There are actually a ton of activities to do with kids in Daytona Beach, including quite a few free and cheap ones! When our family first moved to the area, I was a bit leery about visiting Daytona Beach with our kids, knowing it’s wild reputation. But after some research and planning, I discovered just how delightful this destination could be! The beaches are famous for a reason: the flat white sand is postcard-worthy. There are beautiful natural surroundings for outdoor enthusiasts, auto racing for Nascar fans, and plenty of food and shopping to keep everyone happy. It’s safe to say my mind has been changed about Daytona Beach. We love driving in for a day-long visit now, and I think it would make a fun little escape for anyone needing sun, sand, and kid-friendly activities. 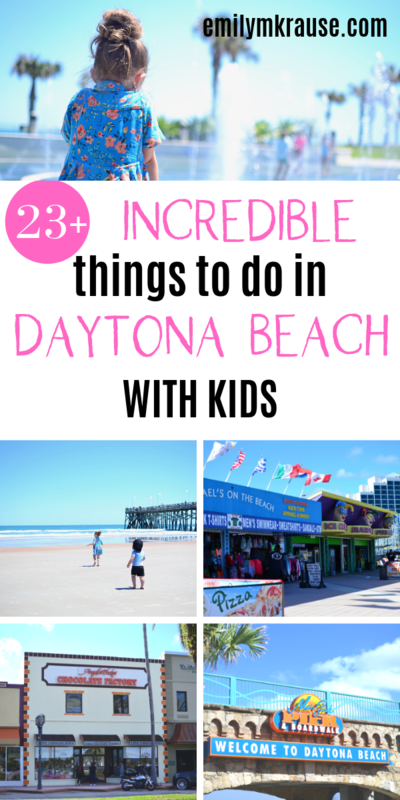 Here are my top recommendations for what to do in Daytona Beach with kids! Angell & Phelps Chocolate Factory was one of the first things we did with our kids in Daytona Beach after moving to the area. It’s the cutest chocolate shop located at the Riverfront Shops of Daytona Beach. You can take the 20-minute tour at one of the designated times Monday through Saturday, then shop for some decadent handmade chocolate to take home. For a $20 fee, you can drive your car onto the beach thanks to the hard-packed sand in the area. The first time our kids saw a car cruising parallel to the waves they thought it was the coolest thing! One benefit is that if you’re having a beach day, there’s no need to unload all of your beach toys, towels, snacks, and water bottles. You can keep everything right there in the car! If your kids are old enough to ride, it might be fun to rent some bikes from the kiosks along the boardwalk and ride bikes along the beach. It will be a memory your kids won’t soon forget, feeling the salty ocean breeze in their hair as they cruise along the sand. There are tours of varying lengths and prices, so whether you’re a die hard auto racing fan, or just interested in checking this legendary spot off your bucket list, you’ll find something that’s perfect for family. The tours take place in open-air trams and will also give you access to the Motorsports Hall of Fame. 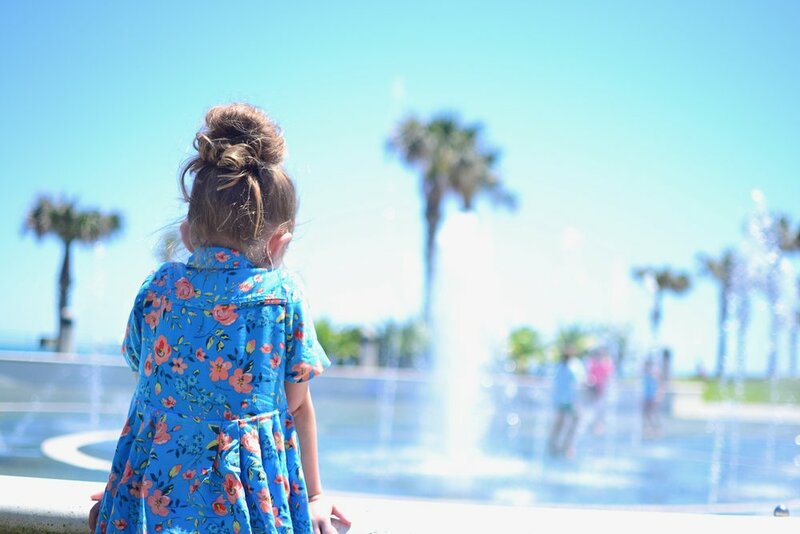 Sun Splash Park is a beachfront park with splash pads, restrooms, a playground, and picnic tables, and it’s free! This is a great spot to take a break from the beach if your toddler is eating too much sand or making a break for the ocean every chance he gets. There are lots of shaded spots for kids to climb and play, and it also offers gorgeous views for a picnic lunch. The Daytona Tortugas are a minor league affiliate of the Cincinnati Reds and they play at Jackie Robinson Ball Park. This historic field is the spot where Jackie Robinson played his first integrated MLB spring training game. To honor the momentous occasion, the field also has a small outdoor museum dedicated to Robinson. If you choose to see a weekend game, make sure to stay for the fireworks afterward! The Charles and Linda Williams Children’s Museum is located at the Museum of Arts and Sciences, and is a hands-on center for kids to explore science experiments, future careers, and musical instruments. Admission will also get you access to the entire museum with exhibits on the history of Florida, Coca Cola, art, and even Teddy Bears. The planetarium is extra, but might make for a fun outing! The Daytona Beach Boardwalk is one of the most famous attractions in the area with arcade games, carnival rides, candy shops, and hotels. You could easily spend a morning or afternoon strolling along and enjoying the view, stopping for ice cream or pizza, or playing games. The Daytona Beach Boardwalk actually has a bandshell that hosts free concerts on summer Friday and Saturday evenings from 7:15-9:30 with fireworks right after the concerts. Head out to the famous Daytona Beach Pier which overlooks the Atlantic Ocean and garners a wonderful view of the Boardwalk. You can simply enjoy the vistas or rent some fishing gear and catch some fish! You’ll also enjoy dining at Joe’s Crab Shack on the pier for some excellent seafood. Some of the best shops and boutiques are located at the Riverfront Shops of Daytona Beach. Bonus? Parking is free and plentiful, and the view of the skyline over the river is stunning. You can’t beat wandering along the sidewalks ducking in and out of shops. This water park is right on the beach, and is the perfect spot for a day of thrilling fun. It’s not just water slides, though. You’ll find arcade games, go-karts, mini golf, and laser tag to name a few exciting activities in store. It’s close to a lot of the Ocean Walk hotels and resorts, so it’s convenient to visit if you’re staying on the beach. Our family loves the saltwater taffy from Zeno’s Boardwalk Sweet Shop! They have tons of flavors to choose from. If you’re not into taffy, they’ve got some excellent ice cream you can enjoy from a bench on the boardwalk overlooking the ocean. This is a no-brainer stop every single time we go to the boardwalk. Donnie’s Donuts serves the best gourmet donuts in the area. They serve both vintage and modern donuts, even allowing customers to create their own if they don’t see what they want. There are two locations around Daytona Beach. One is in Ormond Beach and one is in New Smyrna Beach. Sure, it’s a chain restaurant, but Johnny Rocket’s is such a fun family-oriented experience, and it has a great location overlooking the beach. We loved stoping there with our kids for the classic milkshake, burger, and fries meal. Everyone comes away satisfied and happy. Nearby Ormond Beach has their own version of the oceanfront splash pad at Andy Romano Beachfront Park. It’s not just a splash pad, though. The facilities include restrooms, a snack bar, and a playground for kids. There’s free beach access, and the shoreline is wide with sugary-soft white sand. Just a heads-up: parking can get crazy on the weekends, so try to get there early or visit on a weekday. Just a short walk or drive down the road from Andy Romano Beachfront Park is the Birthplace of Speed Park. It’s a commemoration of the rich history of auto racing that began in the early 1900s in Ormond Beach. It’s a nice little park with some signs where you can read about the history of auto racing, and some picnic tables and gazebos overlooking the beach. You can visit Florida’s tallest lighthouse on the Ponce Inlet just south of Daytona Beach. You can walk to the top of the Ponce de Leon Inlet Lighthouse and visit the museum which includes the keeper’s dwelling, a lens museum, an oil house, and some authentic Cuban rafts. The Marine Science Center is a small aquarium and turtle rehabilitation center with a touch pool, bird observation tower, and a nature trail. It’s a great place for kids to learn all about Florida’s marine life and how to take care of the environment around them. 30 miles west of Daytona Beach is an incredible hidden gem called De Leon Springs State Park. It costs just $6 per vehicle to enter the park, and once inside you can swim in the natural spring which remains at a constant 72 degrees. There are nature trails for hiking, a playground for kids, and boat tours if you want to learn more about the history of the area. Some even believe it to be the site of Ponce De Leon’s Fountain of Youth. The Old Spanish Sugar Mill is located inside of De Leon Springs State Park, and it’s one of the most unique spots to eat in the area! Each table is equipped with a built-in griddle where guests can make their own pancakes. All you have to do when you sit down is order what type of batter you want, and any additional toppings, then get flipping! The restaurant is very small with limited seating, so don’t arrive super hungry. Get there an hour or two before you want to eat and put your name in, then head outside to play and explore. They announce the names over a loudspeaker, so you’ll be able to hear when your table is ready. This charming little beach town is a few miles south of Daytona Beach, and makes a perfect little day trip if you’re visiting the area. If you love art and culture, definitely do some shopping on the quaint Canal Street Historic District. If you love surf culture and good vibes, head to Flagler Avenue to shop and eat. The town is less crowded than Daytona Beach, and you’ll feel like you’re mingling with locals instead of tourists. Get your Free Packing List Printouts Here! Thank you! Check your inbox to confirm your subscription and grab the link to my free resource page with your printables! Grab your free packing list printables!